Last Nite, after MarkPlus Forum in Bandung I was Introduced to Suhu Bhadra Ruci, by MarkPlus Graduate, Alex Surya who is a very good Buddhist. 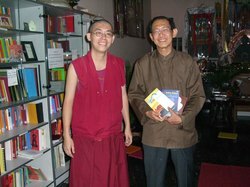 Suhu Bhadra Ruci is Alex’s teacher in Buddhism. And I too want to know the philosophy behind Buddhism, so Alex introduced me to his Suhu. Our two hour midnight conversation is about the true meaning of Life. The Good Heart, Compassion, and Sacrifice for other people in the world. To me, it is very important to understand other religion’s points of view. To understand what are the similarities and differences. Without those understandings, it would be very difficult to develop our EQ, because one important element in EQ is the SENSITIVITY to other people. And how we can control ourselves to make better relationships with other. To understand other faith, we need to open our mind, using our IQ in developing our curiosity in finding new things. And to me, I use my SQ to have a hight level self-awareness to serve other people through our good relationship. All in all, I call it The HUMANWARE. And to do spiritual marketing, one must use its HUMANWARE!! Also attending the forum last night was Ms Mimin, the owner of KLCBS - the number one jazz station in Bandung, who was kind enough to give me an Al-Qur'an from Madinah, three sets of traditional muslim dress, and also an Arabic jazz-style CD produced by her at KLCBS, which I have to use throughout this month on the occasion of MarkPlus Forum Ramadhan Special edition. Philip Kotler, Hermawan Kartajaya, Hooi Den Huan: Think ASEAN!